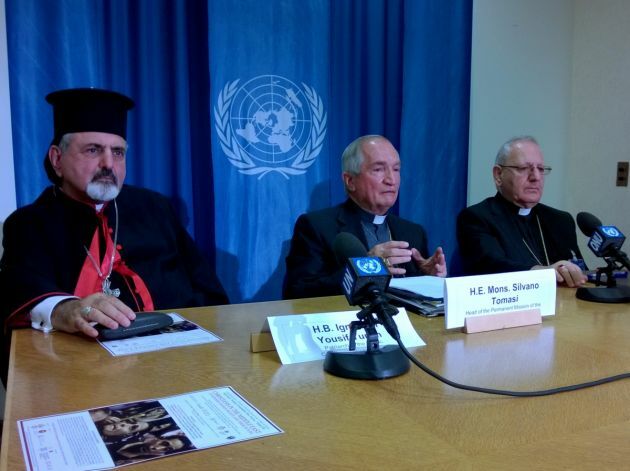 (Photo: Ecumenical News / Peter Kenny)Patriarch Ignace III Yousif Yunan (L), of the Syriac Catholic Church of Antioch, Monsignor Silvano Tomasi, head of the Vatican Mission to the United Nations in Geneva and Patriarch Louis Raphaël I Sako of the Chaldean Catholic Church in Iraq at a press conference at the U.N. in Geneva on September 16, 2014. The Holy See Delegation is pleased to participate in this 32nd International Conference. It recognizes the outstanding contribution of the Red Cross and Red Crescent Movement in response to many human needs, especially in situations of humanitarian crisis and other emergencies. In particular, we wish to acknowledge the efforts of the RCRC in response to the Ebola epidemic that caused very great suffering in Guinea, Liberia, and Sierra Leone. The Movement's engagement in providing Specialized Ebola Care, as well as Safe and Dignified Burials, helped to prevent additional human anguish and loss of life, as a result of the outbreak. Many health care, social service and pastoral care institutions related to the Catholic Church, and other faith communities, worked side-by-side with the national and local members in the Ebola Response efforts. Thus, my Delegation concurs with the decision by this Conference to grant an Award to the volunteers, who selflessly responded to the families and local community members affected by this tragic outbreak. The present Conference coincides with the 50th anniversary of the proclamation of the Fundamental Principles of the Movement: Humanity, Impartiality, Neutrality, Independence, Voluntary Service, Unity and Universality. These provide the overarching theme for this quadrennial gathering. Indeed, many humanitarian actors throughout the world, including religiously inspired organizations, share these same principles. So too, my Delegation supports the efforts of this Conference to strengthen International Humanitarian Law and to monitor carefully its implementation by States and by all other stakeholders. Humanitarian needs are complex in nature and the response required by key stakeholders can run the risk of placing too much emphasis on those aspects with greater legal and technical implications, while downplaying or ignoring those aspects, which in the judgment of the Holy See, are most essential - in other words, the principle of "humanity", by which the Movement means "protecting life and health and ensuring respect for the human being", and through which it aims to "promote mutual understanding, friendship, cooperation and lasting peace amongst all peoples." During his recent address to the United Nations General Assembly, Pope Francis urged the international community to avoid the mistaken conclusion that "... the bureaucratic exercise of drawing up long lists of good proposals – goals, objectives and statistics ... will provide an answer to all the challenges" of today's world. He stressed that, "we are dealing with real men and women who live, struggle and suffer, and are often forced to live in great poverty, deprived of all rights." The Holy See Delegation shares the concern expressed in the conceptual document for this Conference, that "[w]e are confronted today with a hugely complex humanitarian operating environment." The current series of never-ending conflicts is bringing about increasingly difficult and tragic consequences. In a way, we face "a true world war fought piecemeal", which affects numerous areas in our world in different forms and to varying degrees of intensity. Together with the international Community, the Holy See, as well as Catholic Church-inspired organizations engaged in a humanitarian response in all parts of the world, is committed to preventing further deterioration of the situation. To this end, it participated in the World Conference on Disaster Risk Reduction, held in Sendai, Japan, during March 2015, and in the negotiations that led to the adoption of the post-2015 Framework for Disaster Risk Reduction. Increasing investment in disaster prevention and addressing the causes of disaster-risk will eventually reduce the overwhelming costs, the tragic consequences, and the serial occurrences of natural disasters, due to environmental degradation and changes in climate. The means to achieve this objective are increased political will and economic input and a greater deployment of human resources, in conformity with internationally established standards and accords. The best "prevention", however, is through integral human development, which takes into account all aspects of human progress, including social, economic, educational, emotional, and spiritual. Improvement of the quality of life, for both individuals and families, and the promotion of human rights and freedoms, most especially among poor and marginalized communities, can similarly prevent future occurrences of armed conflict, civil strife and failures in upholding the rule of law. In the context of international humanitarian law, an alarming development seems to be gaining ground. The respect and promotion of international humanitarian law is increasingly ignored and violated. The Holy See is worried by these developments that can only lead to more violence, misery and suffering. It associates itself with the sober and urgent warning launched recently by the United Nations Secretary-General and the President of the International Committee of the Red Cross. The description they give of the continued erosion of, and non-compliance with, the rules of international humanitarian law is alarming. These two senior leaders judge the current situation to be unacceptable. They see that the world is at a crossroads and that all state and non-state actors have the duty to engage to "renew a contract for humanity" that should benefit millions of people affected by armed conflicts. Focusing on current and protracted conflicts, the international Community should remain vigilant and tireless in calling attention to the needs of people who find themselves in the midst of humanitarian emergencies. The short attention span of the communications media, and of many others in the international Community, should be challenged by regularly calling attention to the ongoing emergencies that seem to be multiplying in intensity and complexity. Let us emphasize the inter-connectedness of global phenomena and reject the "throwaway culture" that plagues our world and feeds tendencies toward greed, corruption, violence, war, and environmental degradation. Let us insist that all citizens of this world have a responsibility to care for their neighbors. In this regard, the Holy See Delegation proposes a comprehensive definition for "neighbor", since all persons are equal members of the one human family and should be in mutual solidarity. All of us are created with equal dignity and therefore are entitled to equal access to the goods of this world. Moreover, all persons should have an equal say in the formulation of policies and decisions that will affect their own lives and that of future generations. Preventive and remedial measures should go hand in hand. All players must address the root causes of the many problems our globalized world is facing. Based on a shared humanity and dignity, there is an urgent need to collectively confront the global issues affecting the whole human family. Disarmament, and nuclear disarmament in particular, migration, poverty, armed conflicts, respect for human rights and the rule of law, climate change and environmental problems, diseases, etc. are areas where States, the Red Cross and Red Crescent Movement, International organizations and the civil society should work together to secure a better future for coming generations.